The Paris climate-change conference was supposed to be about the needs of big countries and what they are willing to do to slow the warming of Earth’s atmosphere. But in the end, the two weeks of sometimes round-the-clock negotiations have focused at least as much on some of the smallest, most defenseless nations whose very existence could hinge on the outcome of the talks.The result could be a tougher set of policy goals than anyone originally thought could emerge from the conference. While the ultimate agreement is expected to embrace a goal of limiting global warming to less than two degrees Celsius, it also is likely to recognize a far more challenging and aspirational goal of 1.5 degrees Celsius. That tougher language might not be legally binding for countries such as the United States, but the fact that it is in the running is testament to the tireless work of delegations from remote countries facing an urgent threat from the rising seas of a warmer Earth. “The small guys have managed to push the big guys, and that is a big story,” Monica Araya, founder and executive director of the Costa Rican nongovernmental organization Nivela and special adviser to the Climate Vulnerable Forum, said at the conference Friday. The ongoing debate over temperature targets came as delegates at the talks appeared to be nearing agreement on a draft of the climate treaty. Early Saturday, French officials said negotiators had completed what they hoped would be the final draft of the treaty text, which would be put up for debate and a vote in the afternoon. Diplomats worked through the night on Friday to resolve differences over a handful of thorny issues, including financial aid to developing countries hit hard by climate change, as well as rules and procedures for judging whether countries are honoring their commitments to cut pollution. Secretary of State John F. Kerry, in Paris to help push for a deal, said Friday there had been “a lot of progress” but also a few snags during late-night bargaining. For many years, small island nations such as the Maldives — joined more recently by a broader group of climate-vulnerable countries in Africa, Asia and Latin America — have pushed to make the world recognize tougher climate goals. It has been a long-shot fight because of the massive effort required to meet even the less stringent goal of restricting warming to less than two degrees Celsius above preindustrial temperatures, and also because of their relative lack of political and economic power. “Maldives itself has over 3,000 years of history,” said Ahmed Sareer, the Maldives’ permanent representative to the United Nations and its ambassador to the United States. “The location, the culture, the language, the traditions, the history, all this would be wiped off” if sea levels are allowed to rise high enough. Nonetheless, holding warming to 1.5 degrees hardly seemed realistic. With the world already at about one degrees Celsius over preindustrial levels and current national emissions pledges well off target even for two degrees, how would 1.5 ever happen? Still, small island nations brought their case to Paris. Their message was epitomized by a poster at the Wider Caribbean Pavilion at the vast Le Bourget conference center. The poster shows a young girl up to her neck in ocean water. Behind her, the now-submerged beach she’s standing on sports a drowned sign: “1.5 to stay alive,” it reads. 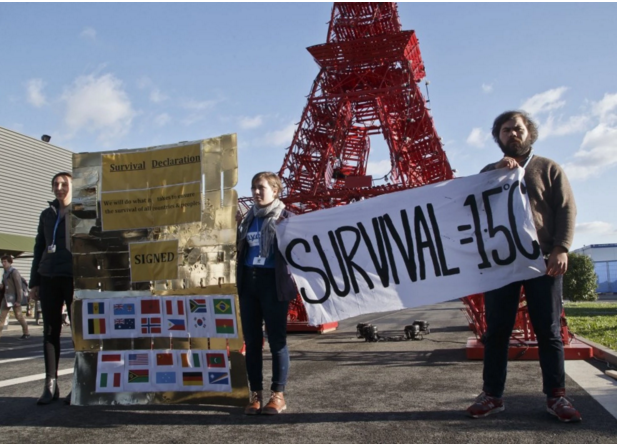 The talks in Paris were barely getting underway last week when representatives from Antigua and Barbuda made a series of impassioned pleas to the nations gathered to negotiate a climate treaty. In speeches and in a written appeal, officials from the islands warned that their homeland was literally in danger of being swept away by rising sea levels. Even if all countries honored their current promises to cut greenhouse-gas emissions, global temperatures would rise by 2.7 degrees Celsius — and “that would be too much,” the delegation said, summarizing its view on its official Twitter account. Antiguan officials delivered similar messages in closed meetings, warning that other island nations faced “an existential threat” unless the negotiators increased their ambition and sought even stricter emission controls to keep the temperature rise from exceeding 1.5 degrees, according to a diplomat present during the session. For these countries, the risks include not just the loss of land but the death of vital fisheries as more coral reefs die because of higher temperatures and increased acidity. Similar appeals have been made for years, but in Paris the islanders acquired new allies: African nations, Europeans, even some Americans expressed sympathy, the diplomat said. Something could still change in how the final text treats 1.5 degrees. “Nothing is agreed until everything is agreed,” as the president of the proceedings, French foreign minister Laurent Fabius, has put it here. Still, observers say that the moral appeal of small-islanders has merged with a growing body of troubling science suggesting that their temperature target turns out to be a meaningful one. It was not until 2008, at the Poznan climate meetings in Poland, that the coalition of small island nations called the Alliance of Small Island States formally stood up for the position of a 1.5-degree temperature target, said Bill Hare, a physicist and a founder of Climate Analytics. The group has conducted considerable research on the 1.5-degree target to help small island nations and developing countries. But there was not much science at the time to differentiate 1.5 degrees from two degrees. Climate Analytics science director Michiel Schaeffer and scientific consultant Joeri Rogelj note that many climate studies have tended to compare impacts at two degrees with impacts at much higher temperature increases, rather than to suss out the differences between 1.5 and two, which turn out to be fairly substantial. And then, most of all, there is sea-level rise. Recent research suggests not only that every one degree of temperature increase (Celsius) will lead to about 2.3 meters of long-term sea-level rise (over seven feet), but that the long-term stability threshold of the Greenland ice sheet may also lie at around 1.5 degrees, or just above it. (The stability threshold of the West Antarctic ice sheet may already have been reached).